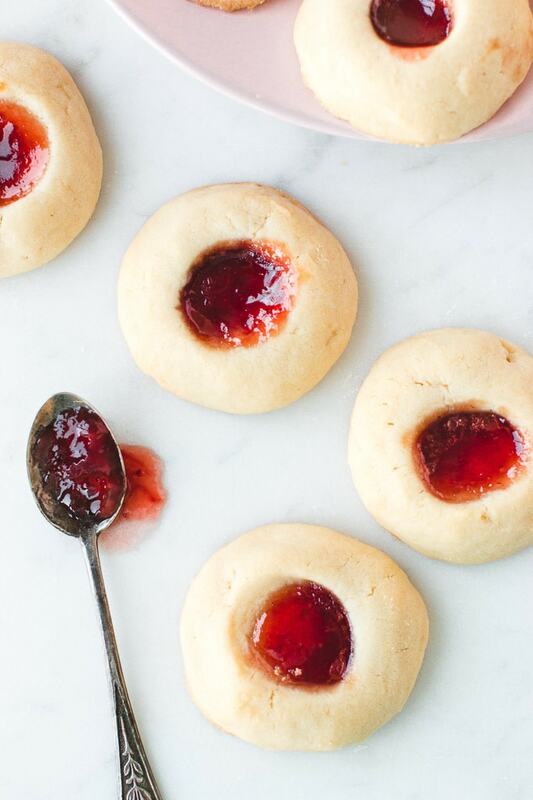 Melt-In-Your-Mouth Thumbprint Cookies | Pretty. Simple. Sweet. 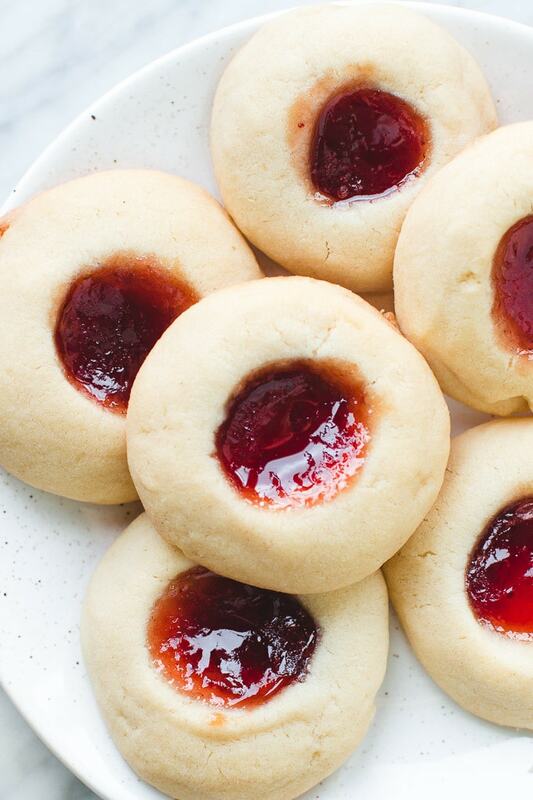 An easy recipe for shortbread thumbprint cookies filled with jam. 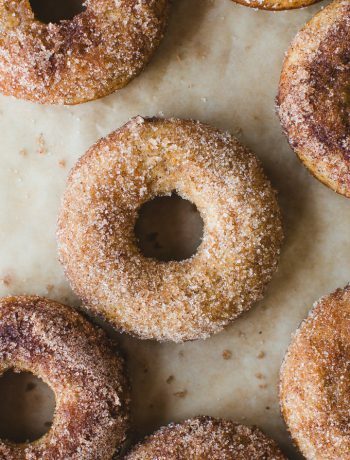 These classic cookies aren’t too sweet and have a delicious melt-in-your-mouth texture. 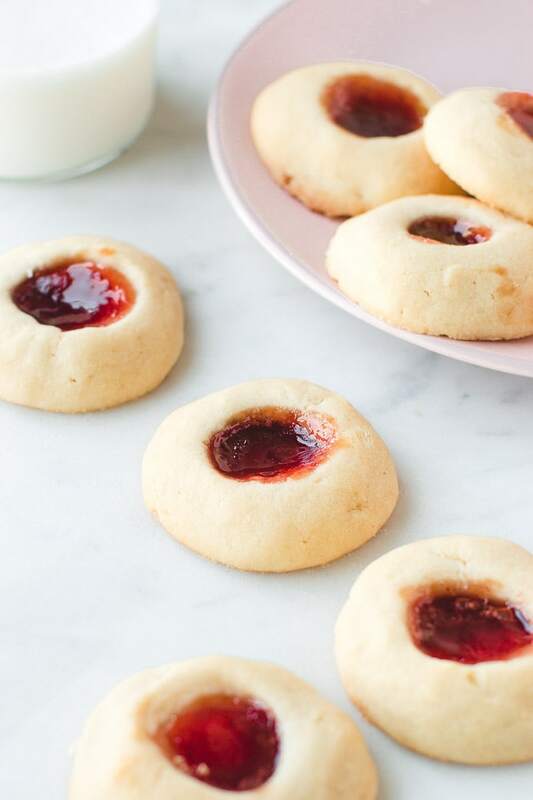 Jam thumbprint cookies are popular around the holidays, but they make a delicious snack all year round, and are especially good with coffee. I have a few thumbprint cookie recipes but this is my favorite one. The cookies aren’t too sweet, have the perfect ratio between cookie and jam, and they are soft and crumbly. Their texture is amazing! 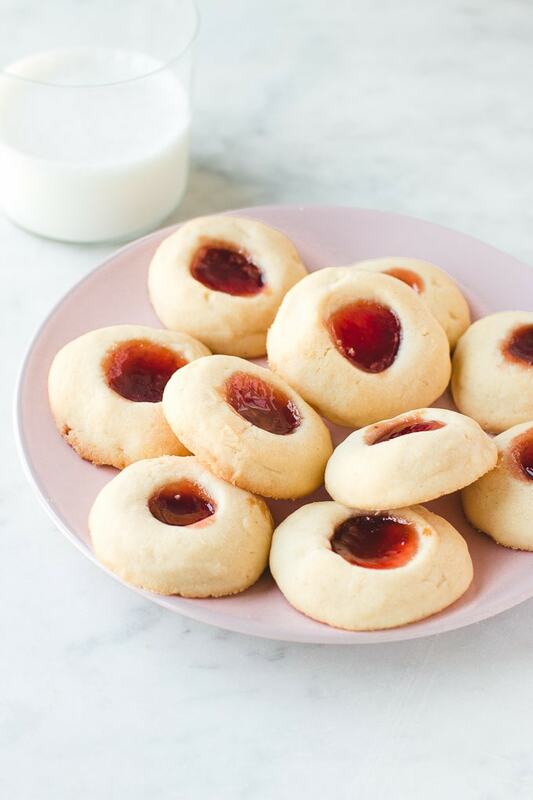 Jam thumbprint cookies are basic shortbread cookies made of flour, sugar, butter, and vanilla extract for flavor. Although they are often buttery and tender, to really get a crumbly, melt-in-your-mouth texture, I like to add egg yolks. If you don’t want to use 2 egg yolks, you can use one egg instead. The texture will be slightly different but the egg will still add richness to the cookies. Chilling isn’t mandatory but I recommend it because the dough will be very soft. After chilling it for at least 30 minutes, or 1 hour, the dough will be easier to roll into balls. 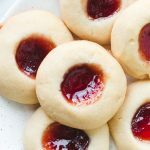 Raspberry thumbprint cookies are my favorite but strawberry, blueberry, or any flavor works, so use your favorite jam. For a smooth puree you can use seedless jam or warm up the jam a little bit and strain the mixture through a fine mesh strainer, but that’s optional. Using jam with seeds is OK.
You can drizzle the cookies with melted white chocolate which is perfect if you use raspberry, strawberry, or blueberry jam, or use sugar icing made of 1 cup of powdered sugar mixed with 1-2 tablespoons of cream or milk. For peanut butter and jelly cookies, drizzle cookies with melted peanut butter. 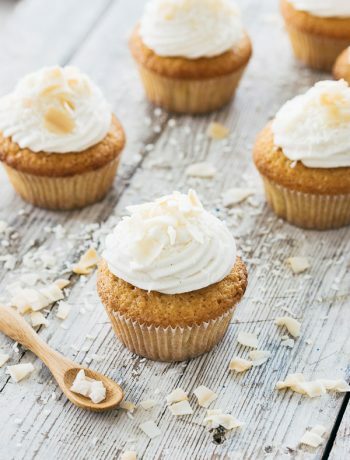 Using a handheld or stand mixer with a paddle attachment, beat butter and sugar on medium speed for 3-4 minutes until fluffy. Add egg yolks and vanilla extract and beat until combined. Reduce speed to low. Add flour and beat just until combined. Do not overmix. The dough will be soft at this point so cover the bowl with plastic wrap and place in the fridge for about 1 hour or until firm enough to easily roll into balls. Preheat oven to 350°F/180°C. Line 2 baking sheets with parchment paper. Take dough out of the fridge. Roll dough into 3cm balls, the size of 1 tablespoon. Place onto prepared baking sheet, spacing them about 5cm apart. Use your thumb or the back of a wooden spoon to make an indentation into the center of each cookie, and fill with about 1/2 teaspoon jam. Bake cookies for 13-15 minutes, or until cookies appear golden brown at the edges. Transfer to a wire rack and allow to cool completely. 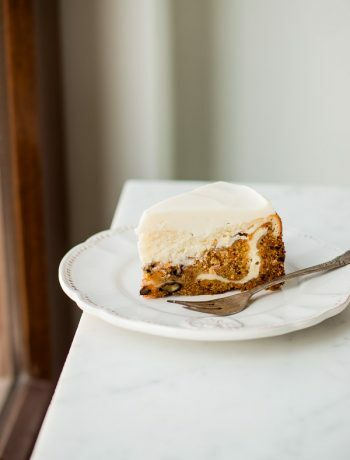 Store cookies in an airtight container at room temperature for 3 days or in the refrigerator for a week. I’m glad you like it, Natasha! To make it a bit chewy I use egg yolks. To make it more chewy you can use some brown sugar or play with the amount of butter, but I can’t say the exact amounts without testing it.